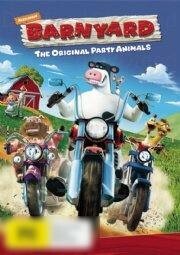 Synopsis: From Steve Oedekerk and Nickelodeon Movies two of the co creators of Jimmy Neutron Boy Genius and filmed entirely in CGI comes this hilarious look at what really happens in a barnyard when the farmers back is turned. Barnyard is a lighthearted tale centering around Otis voiced by Kevin James a carefree party cow who enjoys singing dancing and playing tricks on humans. Unlike his father Ben voiced by Sam Elliott the respected patriarch of the farm and Miles the wise old mule voiced by Danny Glover Otis is unconcerned about keeping the animals humanlike talents a secret. But when suddenly put in the position of responsibility the udderly irresponsible cow finds the courage to be a leader.